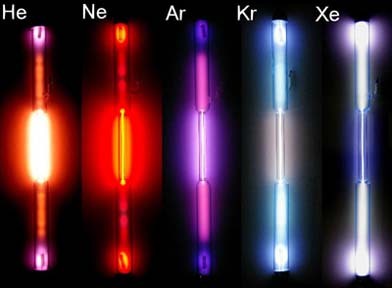 Noble gases are used in each of the IQube instruments. The following information was derived from various web sites and researchers who have been studying the effects of the inert noble gases. We are not making any claims and only present their information from various observations. Again, I am only passing along their information. We are the first to use the individals voice to stimulate their own Aetheric Fields through a Scalar Miracoil. We created a special optical quality quartz crystal insert that allows Rejuvenation IQube, VAHS IQube, Ascension IQube, Protection IQube and and Sacred Scalar Generator owners to place the gas inserts into the middle of their scalar Miracoil. Helium (He) Helium has the smallest size of the inert gases. This is symbolic on the subtle levels of the interconnectivity between many beings.The collective unconscious is stimulated and brought into a state of coordination. This will generally result in the release of negativity from the day. There is a significant relief of insomnia from using helium. This is one of the key indications of when to use the helium rather than the other gases, when there is sleep difficulty. Helium has some anti-viral properties. It is quite useful when wishing to connect to the Earth. This can be valuable in the birthing process. It is the most mutable of the gases, existing not only on the physical level but able to shift into other planes of existence as well. Helium is the main substance that is used by our sun in the stepping down process of higher vibrational realities into a more 3-dimensional base. There is an increase in life force in the presence of helium. Neon (Ne) The primary use of neon is to stimulate the root chakra and connect it to other energy sources. The root chakra is the lower energy center relating to the reproductive or digestive system. Neon will generally bring more energy into the physical body. A sense of connection to the Earth may be felt. Neon can assist individuals who are attempting to lose weight and wish to understand more about the lessons involved. It then becomes easier to stick to a diet and to understand what is involved in changing ones body image to match an internal image. The energies associated with the need to sometimes protect oneself from others may become more visible. As one becomes stronger and more aware of earth energy, there is less need for such protection. With this deeper connection to Earth, people can have a deeper awareness of the material portion of their existence. Neon is very grounding. It can be used to antidote unwanted psychic energies or bring one back into the body when one wishes. It can be worn in the lower part of the body such as the feet and legs. Any negative thought form dealing with sexual issues or issues of survival would be assisted by neon. Argon (Ar) Argon has its roots in energy. It symbolizes the transition energies that are now important for Earth. It is the most valuable gas for most individuals. The argon energy can be slightly stimulating over time. This can provide a general boost in inner strength and a deeper awareness of the power chakra or solar plexus area. Mankind is moving through an important condition of dramatic change and dealing with the power center in individuals is of tremendous importance right now. Argon is the most plentiful of the inert gases in the Earth’s atmosphere and this is its signature. There will be an awareness of what you have learned in the world, how this is influenced by love and the emotions in the first and second chakras, and how this is applied in your life. This is the level from which argon is working. Argon can be used by anyone with no side effects and many beneficial ones. It can release thought forms that have stood in the way of bringing more energy into the physical body. It is recommended for dealing with powerfully entrenched negative attitudes, blockages at the conscious level and psychological patterns that one wishes to change. Argon can increase the coordination of the mental body and spiritual body in working in concert with the aetheric body. We also offer Pure Argon in our Protection IQube program. Krypton (Ke) Krypton can stimulate many psychic gifts in people. This can be quite dramatic. It will supply just the right push for people to reach the full potential of their somewhat dormant abilities. In addition, krypton can make one more aware of negative thought forms derived from past-life energies, that tend to be mysterious. Once brought into awareness these energies can be more easily dealt with and released. These mysterious qualities are symbolized by the combination of astrological influences concerning the planets Neptune and Uranus. The signature of krypton derives from its ability to bridge between the argon and xenon levels. Xenon is representative of very high and powerful energies most utilized throughout the galaxy. Argon is representative of the human life-stream and of the Earth. Krypton can clear confused mental states by bringing brain waves into greater synchronization. There can also be an improvement of memory function and a balancing of the right and left brain. Xenon (Xe) – Crown Chakra Opening There will be stimulation of the crown chakra, a higher-self connection to many aspects of one’s life and a deeper soul awareness of one’s soul connection to God. There can be a deeper awareness of collective consciousness of humans as well. This stimulation of the crown can develop a deeper attunement to spiritual principals and a greater facility for working appropriately with psychic gifts. Its main signature has to do with counteracting the detrimental effect that the sun has on the aetheric bodies of all beings within this solar system. While most other planets with atmospheres have a greater concentration of xenon, much of it was removed from the Earth’s atmosphere in the past for the purpose of deliberate life-shortening and the cessation of most of xenon’s natural regenerative capabilities in humans. For those wishing to work with the regenerative principal xenon can be a big help when combined with deep, clear and focused visualizations. This is the device to use for manifestation and understanding of the higher dimensional realms.